Edouard-Théophile Blanchard (1844-1879), The Death of Astyanax (1868), oil, dimensions not known, Ecole Nationale Supérieure des Beaux-Arts, Paris. Image by VladoubidoOo, via Wikimedia Commons. Whatever the historical basis for the myths of the Trojan War, one of the great challenges is discovering how those myths changed between about 1200 BCE (when Troy most possibly fell) and the appearance of the first coherent accounts several hundred years later. 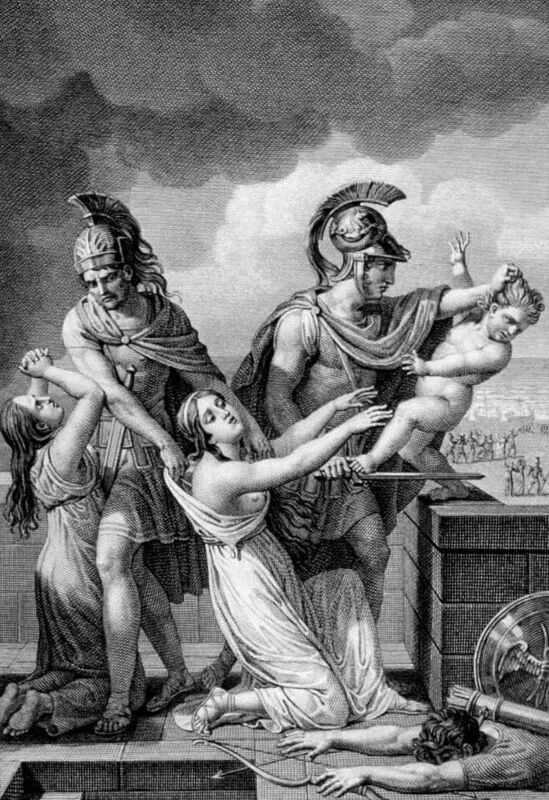 This article looks at the evolution of one of the most horrific events now part of these myths, the murder of the Trojan royal child Astyanax. Hector, crown prince of Troy, was killed in battle with Achilles long before the fall of Troy. His father King Priam, wife Andromache, and young son, named Scamandrius but known to all as Astyanax, all survived until the city was sacked following the entry of the Greeks inside the Trojan Horse. One Greek warrior, Neoptolemus or Pyrrhus, the son of Achilles, was responsible for killing both Priam and Astyanax during the sacking. The king had taken refuge with his son Polites at the altar of Zeus. Neoptolemus first killed Polites, for which Priam rebuked him by throwing a spear at his shield. Neoptolemus then dragged Priam to the altar, where he killed him with his sword. The death of Astyanax may have been more deliberate, as a policy to eliminate any potential royal succession after the deaths of Priam and Hector, or as a sacrifice to grant the Greek fleet favourable winds for its return. Neoptolemus seized the infant Astyanax from his mother’s arms, and threw him from the top of the walls of Troy, or perhaps from one of its high towers. Following that, Andromache was taken as a concubine by Neoptolemus, and was nearly murdered by his wife Hermione, the daughter of Menelaus and Helen (before she eloped to Troy with Paris, and ‘launched a thousand ships’). 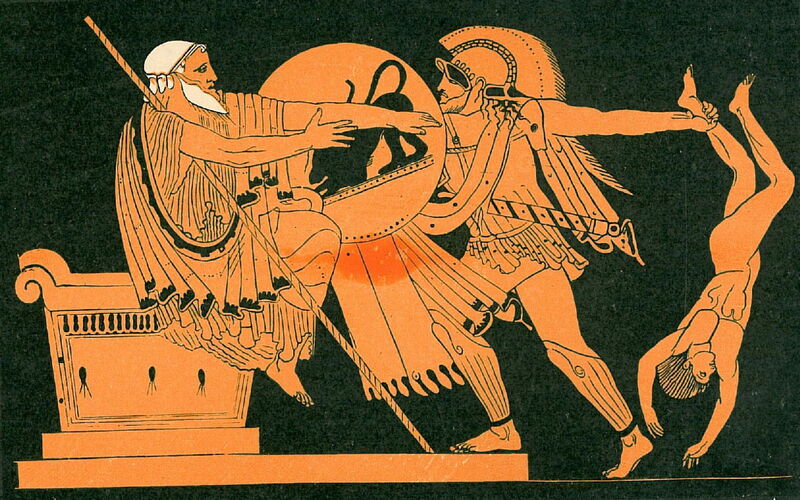 Although many have the impression that the killing of Astyanax is described by Homer in his Iliad, like a lot of Trojan myth, the story actually appears in conflicting forms in other sources. Then the bright son of bold Achilles led the wife of Hector to the hollow ships; but her son he snatched from the bosom of his rich-haired nurse and seized him by the foot and cast him from a tower. So when he had fallen bloody death and hard fate seized on Astyanax. Neoptolemus kills Priam who had fled to the altar of Zeus Herceius; […] The Greeks, after burning the city, sacrifice Polyxena at the tomb of Achilles: Odysseus murders Astyanax; Neoptolemus takes Andromache as his prize, and the remaining spoils are divided. Have hurled to death from Ilion’s tower. until at last she lost her human form. where the long Hellespont is narrowed down. Jove’s altar drank old Priam’s scanty blood. The priestess of Apollo then, alas! she lifted supplicating hands in vain. victorious Greeks drag off as welcome spoil. when Hector fought for honor and his country’s weal. The record of the Trojan War in visual arts also has a long gap of over half a millenium following the possible fall of the city. Uknown artist, A Greek Warrior Kills a Trojan Prince in the Arms of their Mother (c 675-650 BCE), large relief pithos found at Mykonos, dimensions not known, Archaeological Museum of Mykonos, Mikonos, Greece. Image by Zde, via Wikimedia Commons. A spectacular relief found at Mykonos, dating from about 675-650 BCE, is one of the earliest records, and includes a scene of the wooden horse and the Greek soldiers within. 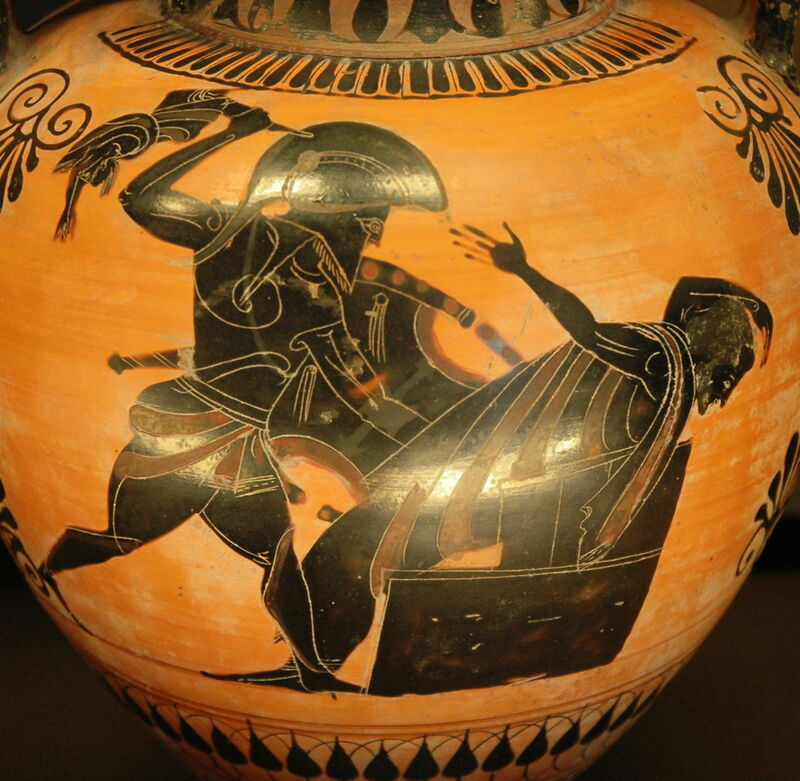 This grizzly scene of a child being murdered with the sword of one of the Greeks, and being held by its Trojan mother, could be a generic representation, but could equally refer to a specific killing, such as that of Astyanax. Notably it does not show the child being dropped from the walls. 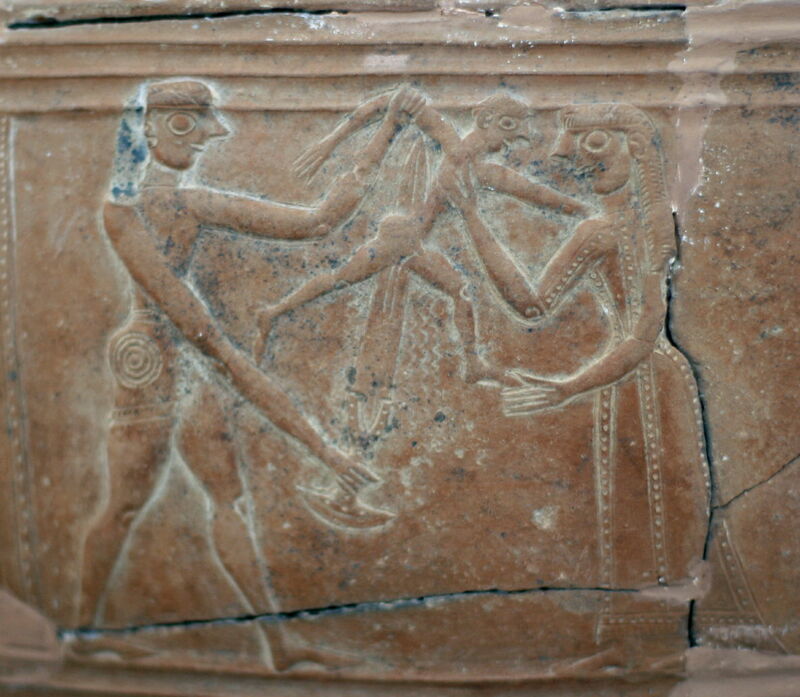 Unknown artist, Neoptolemos kills Astyanax (c 560-550 BCE), Boeotian black-figure tripod-pyxis from Tanagra, dimensions not known, Antikensammlung Berlin, Berlin. Image by Marcus Cyron, via Wikimedia Commons. Although it is not easy to make out the details on this Boeotian black-figure tripod-pyxis from Tanagra, it appears to show a Greek warrior swinging the body of a child from his right arm, using it as a weapon to beat a Trojan, who is laid back over an altar. It dates from about 560-550 BCE. If the Greek warrior is Neoptolemus, the child Astyanax, and the Trojan King Priam, this would indicate a new story which has not been passed down in the verbal accounts, in which both the Trojans were murdered together in this horrific manner. Unknown artist, Priam killed by Neoptolemus (c 520-510 BCE), Attic black-figure amphora from Vulci, diameter 24.5 cm, Musée du Louvre, Paris. Wikimedia Commons. 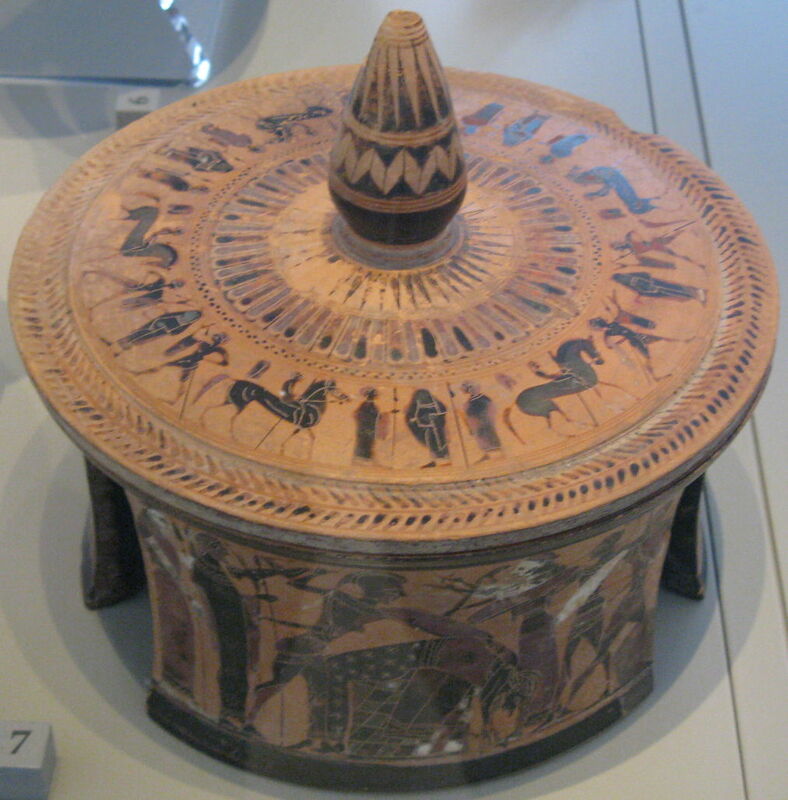 That is the same story, and a visually very similar image, shown much more clearly in this slightly later Attic black-figure amphora from Vulci, from about 520-510 BCE. Unknown artist, Neoptolemus kills Priam (c 510 BCE), side A of an Attic black-figure amphora, Martin-von-Wagner-Museum, at Staatliche Antikensammlungen, Munich, Germany. Image by Bibi Saint-Pol, via Wikimedia Commons. 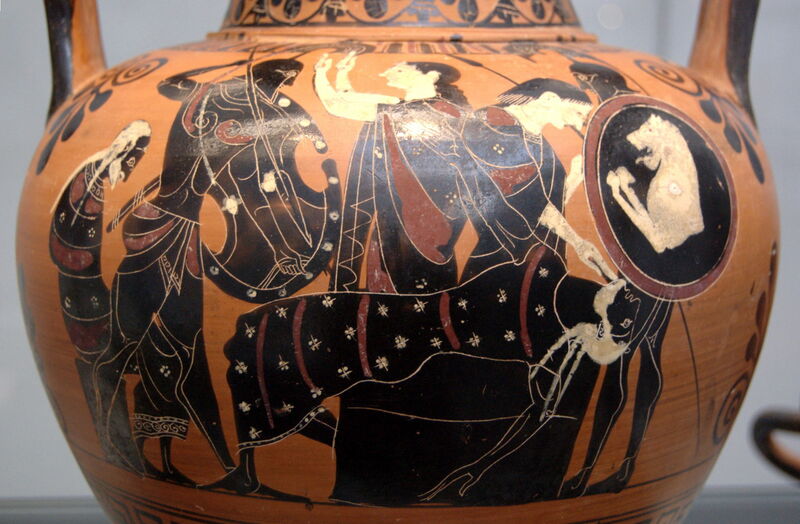 Only slightly later, in about 510 BCE, this Attic black-figure amphora has removed Astyanax, but left Neoptolemus to murder Priam, who is shown next to Priam’s wife Hecuba, who survived and was taken captive. Unknown artist, Neoptolemus and Priam (date not known), further details not known. Wikimedia Commons. Although I do not have a date or source for this reproduction of a vase painting, it shows an intermediate version of the story, in which Neoptolemus is about to drop Astyanax over the walls, in front of King Priam. The classical record therefore shows that, in visual arts, the earliest account suggests Astyanax may have died by the sword, but a hundred years later the child was used to bludgeon his grandfather to death, and later still the murders became separate, with Astyanax being dropped from the walls, and Priam being killed on the altar. The myths of Troy became popular subjects of painters from the Renaissance on, although the deaths of Astyanax and Priam do not seem to have been depicted much, if at all, prior to the nineteenth century. 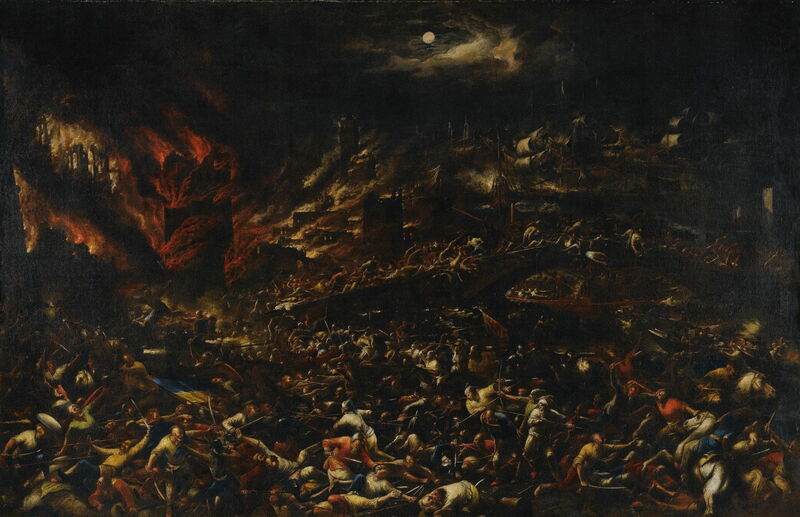 This painting by Gillis van Valckenborch of The Sack of Troy from around 1600 is typical of the many very atmospheric works showing this event on a grand scale. Unknown artist, Astyanax is Dropped from the Walls of Troy (date not known), engraving, further details not known. Wikimedia Commons. This engraving is unfortunately undated, but shows the developed story of a Greek warrior, here allegedly Odysseus rather than Neoptolemus as the warrior. I think that this was probably engraved in the late eighteenth or early nineteenth century. The late nineteenth century then saw a cluster of major paintings depicting detailed stories of the fall of Troy. 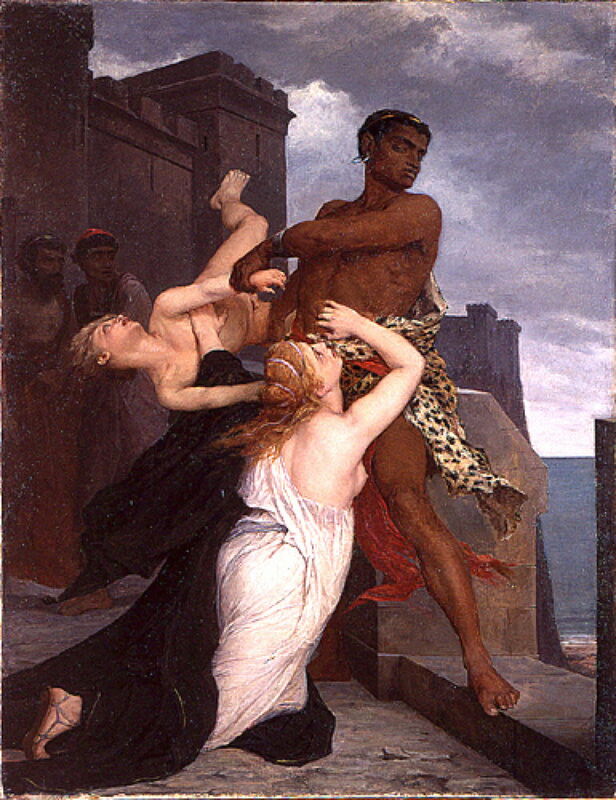 Edouard-Théophile Blanchard won the Prix de Rome in 1868 with his painting of The Death of Astyanax, and its unconventional depiction of Neoptolemus as a North African. According to myth, Neoptolemus’ father Achilles was the king of Thessaly, in central Greece. Andromache pleads on her knees with the warrior to spare her son, her left hand vainly trying to prevent him from being slung from the wall. Two men cower in fear in the background. Two of Troy’s famous towers are shown, but there is no smoke or other evidence of a sacking in progress, neither is there any sign of King Priam. 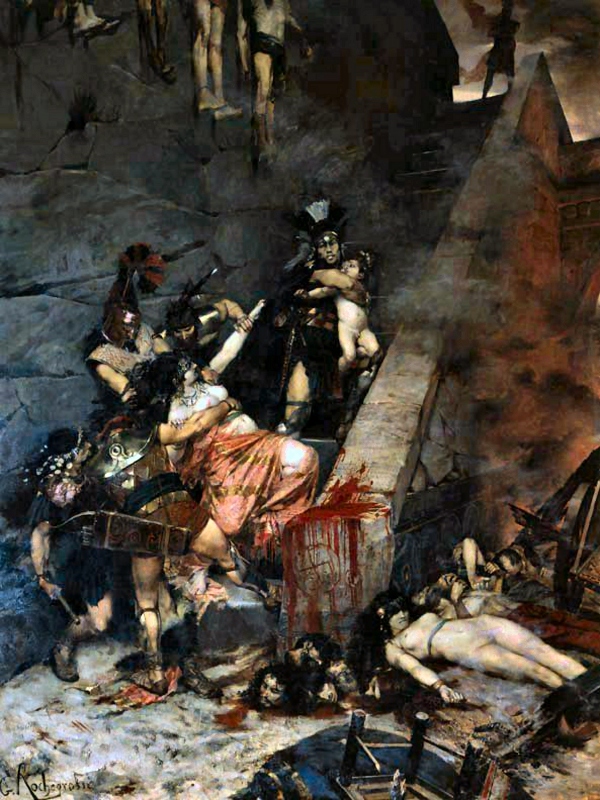 Georges Rochegrosse enjoyed great success at the Salon in 1883 with Andromache, a huge and gruesome painting nearly nine metres high. Andromache is at the centre, being restrained by four Greeks prior to her adbuction by Neoptolemus. Her left arm points further up the steps, to a Greek warrior in black armour holding the infant Astyanax, as he takes him up to the top (where another Greek is shown in silhouette) to murder him. There is death and desolation around the foot of the steps: a small pile of severed heads, a jumble of living and dead, and the debris of the sacking of Troy. 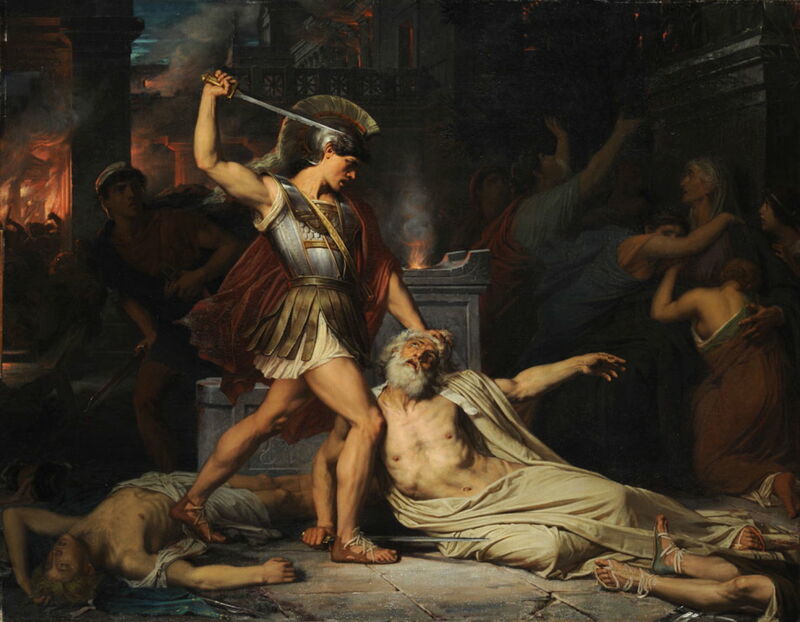 Jules Joseph Lefebvre (1834–1912), The Death of Priam (1861), oil on canvas, 114 x 146 cm, École nationale supérieure des beaux-arts, Paris. Wikimedia Commons. Jules Joseph Lefebvre won the Prix de Rome in 1861 with his The Death of Priam; Georges Rochegrosse was later one of his students. A thoroughly conventional, and very Spartan, Neoptolemus is just about to swing his sword at the prostrate figure of King Priam, who is lying on the floor by the altar to Zeus. Priam looks up at his killer, knowing that he has only seconds to live. Behind Neoptolemus is another body, presumably that of Priam’s son Polites. To the right, in the darkness behind, Queen Hecuba tries to comfort other Trojans. At the left, a young Trojan is trying to sneak away, back into the burning city, with smoke twisting its way into the dark sky. I cannot find any subsequent paintings showing these terrible stories, but there is one very moving painting which brings them to a close. Frederic, Lord Leighton’s Captive Andromache (c 1886) shows Hector’s widow, and Astyanax’s mother, swathed in black, queueing for water among other Trojan prisoners. She appears lost in thought. The evidence above suggests that, prior to 500 BCE, there was no single or coherent account of the death of Astyanax. Those producing verbal accounts and visual artists gave a range of different stories, and attributed the murder to either Neoptolemus or Odysseus. Over the next few centuries, the story became fixed to that told by Ovid in his Metamorphoses, and propagated ever since. Although narrative painters in the late eighteenth century may have changed one story – that of Salome – they remained faithful to the late classical account of the death of Astyanax. However, the evidence above is consistent with the story of Astyanax having been fabricated after about 700 BCE. It may well be completely mythical. Woodford, Susan (2003) Images of Myths in Classical Antiquity, Cambridge UP. ISBN 978 0 521 78809 0. Evelyn-White, HG (trans) (1914) Hesiod, The Homeric Hymns, and Homerica at Project Gutenberg. Euripides, Murray, G (trans) (1905) The Trojan Women at Wikisource. Ovid, More, Brookes (trans) (1922) Metamorphoses at Perseus. Posted in General, Language, Life, Painting and tagged Blanchard, Lefebvre, Leighton, Metamorphoses, narrative, Ovid, painting, Rochegrosse, Troy. Bookmark the permalink.